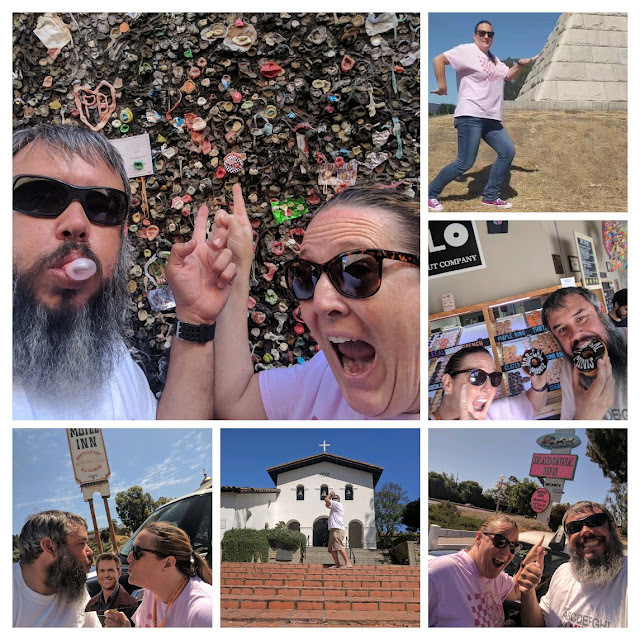 Let's just say we had an 'a-MINI-zing' time in San Luis Obispo. 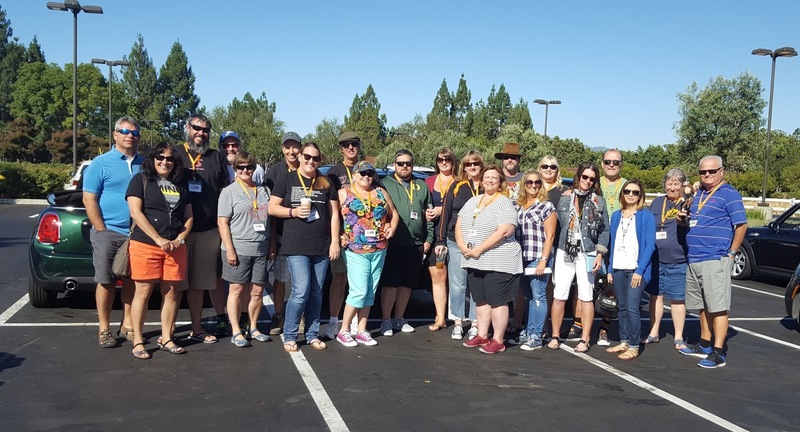 By the numbers, we had 11 cars and 22 people who join in on the fun. It was nice to meet new members: Jessica & Josh Larson and Dave & Anne Sitter. We also had a couple guest who aren't MINI owners yet, but I think we might have convinced them it's time to get one. We had a hard deadline to hit for lunch at the Firestone Walker Brewing Taproom Restaurant, so we just blew down US 101 to Paso Robles. We arrived around 11:30 am. Lucky for us, we arrived before the heavy lunch crowd. 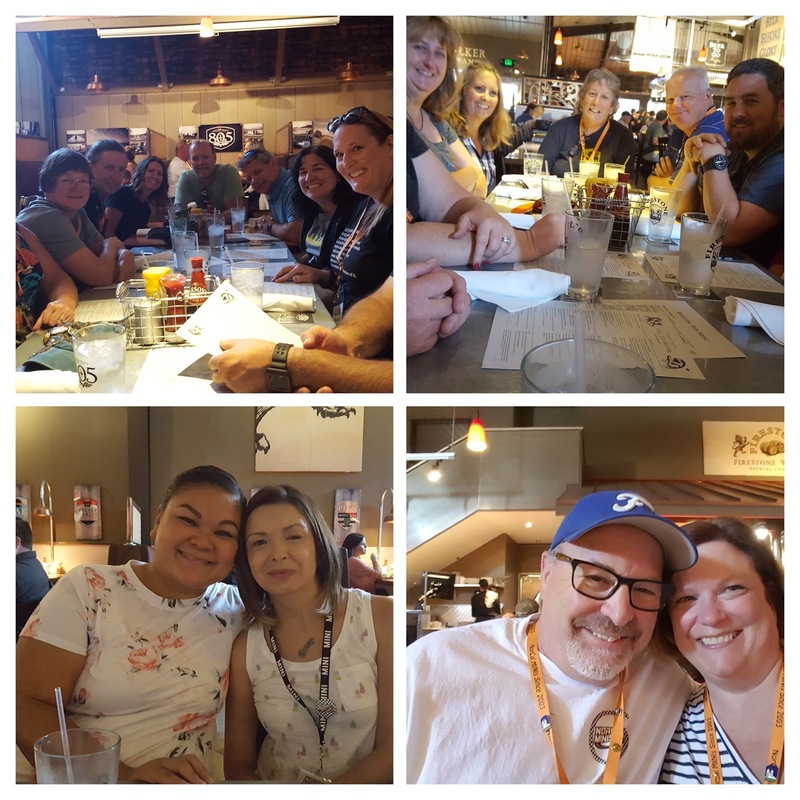 Firestone Walker Brewing did a good job of accommodating our large group. 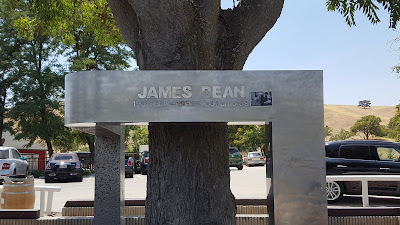 After lunch, we headed to the James Dean Memorial. Visiting the James Dean Memorial has been on one of my bucket lists for awhile since moving to California. 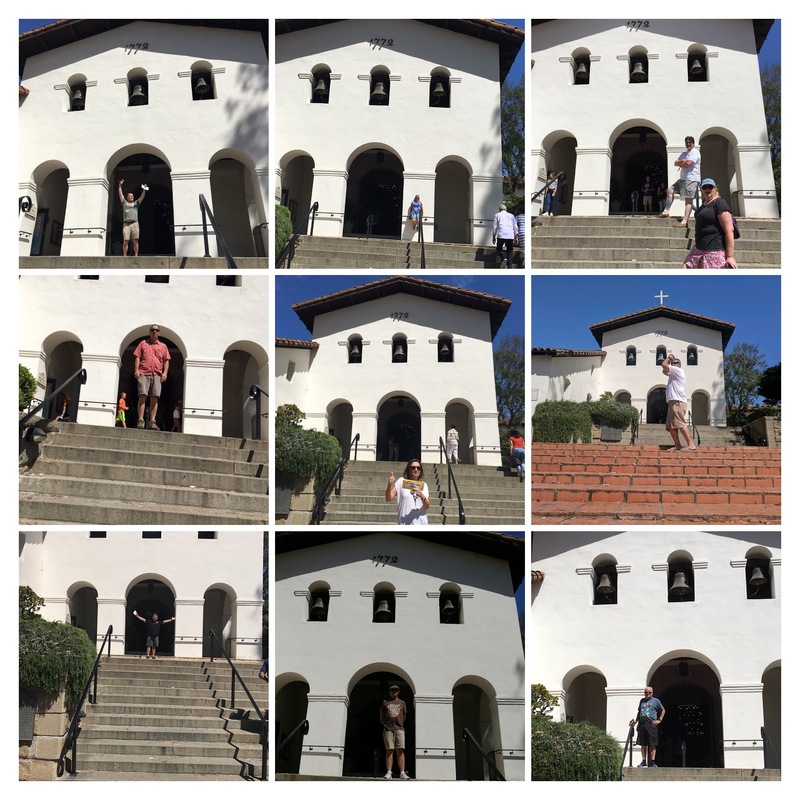 Making the pilgrimage to Dean's Memorial with a few MINIs just made it more special for me. The location of the actual crash site, the intersection of Highways 41 and 46 was dedicated the James Dean Memorial Highway in September 2005, with the memorial located @ Jack Ranch Cafe, 19215 California 46, Cholame, California. From the James Dean Memorial we headed on some back roads to B&E Vineyards located at 10000 Creston Road in Creston, CA. It's a favorite of mine and when I'm in the area I have to stop in to replenish my stock of "Red Rhythm". 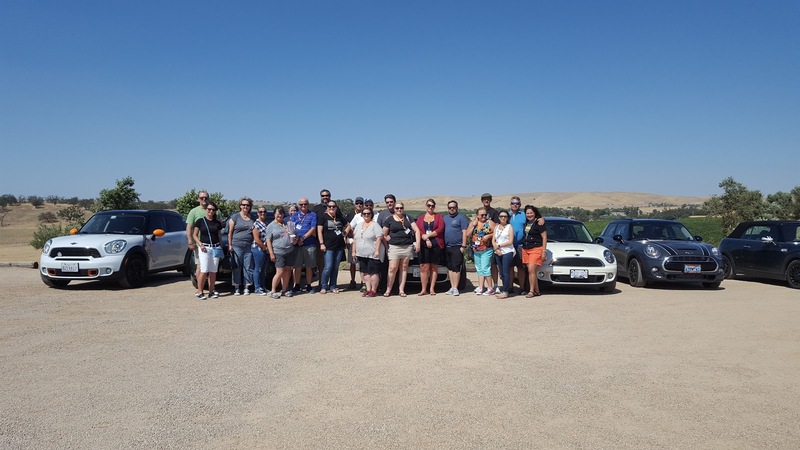 I thought the group might enjoy a little wine tasting and the view from their tasting room. 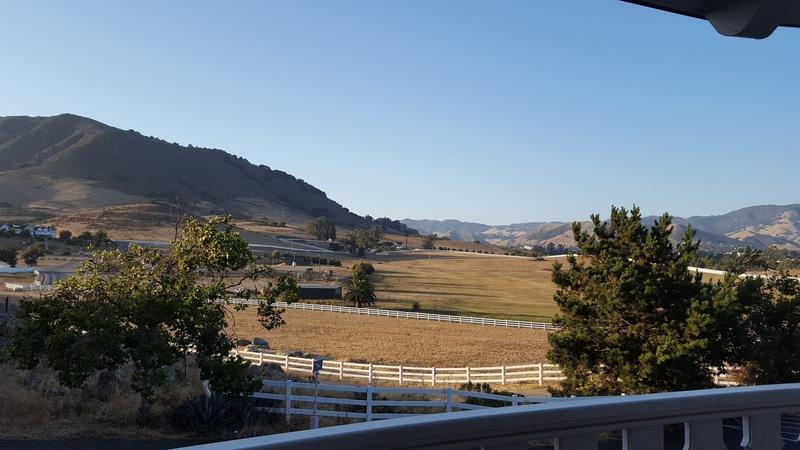 The vineyard is family-owned and operated and they live on the property just a short distance from their tasting room. 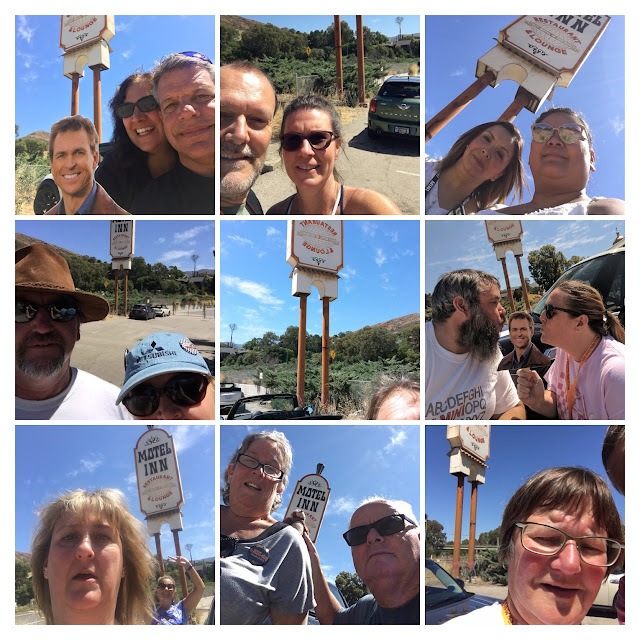 Since we used more time at lunch than I anticipated, we all headed to the Madonna Inn to check into our rooms. A few of us took the opportunity to relax at the pool before meeting for the 'room tour' we had before everyone went off for dinner. The Madonna Inn really is a treat to experience at least once. As I write this recap, I realized I didn't take that many photos of the rooms as I was too busy checking them out. A few had little balconies with great views. More photos of the rooms can be found in the shared album listed below. With clues in hand, off they went! 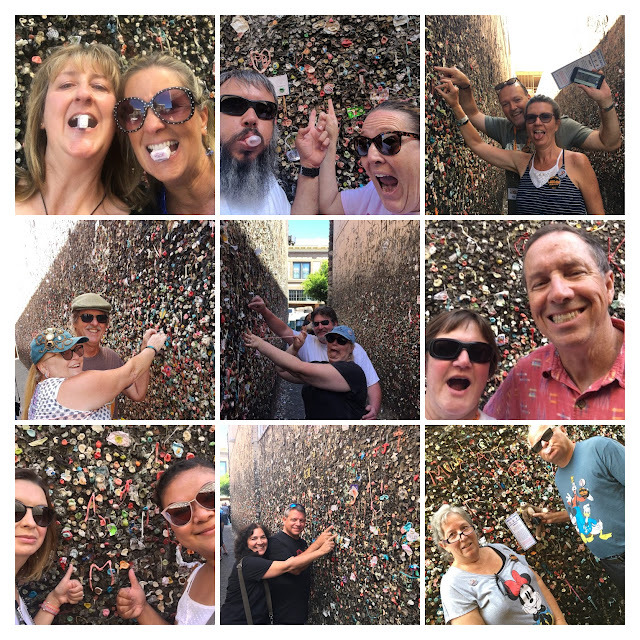 As soon as the photos started coming into us we knew this was a hit and my fear of everyone wanting to kill me subsided. Whew! Congratulations, you have spent the night at the historic Madonna Inn. This landmark resort hotel, opened as a motel inn on December 24, 1958 starting with 12 rooms. In 1966, the Inn’s original units were burned to the ground in a dramatic fire. It reopened a year later, and by the end of the decade, all of the rooms had been rebuilt in the unique & ornate style they are known for today. 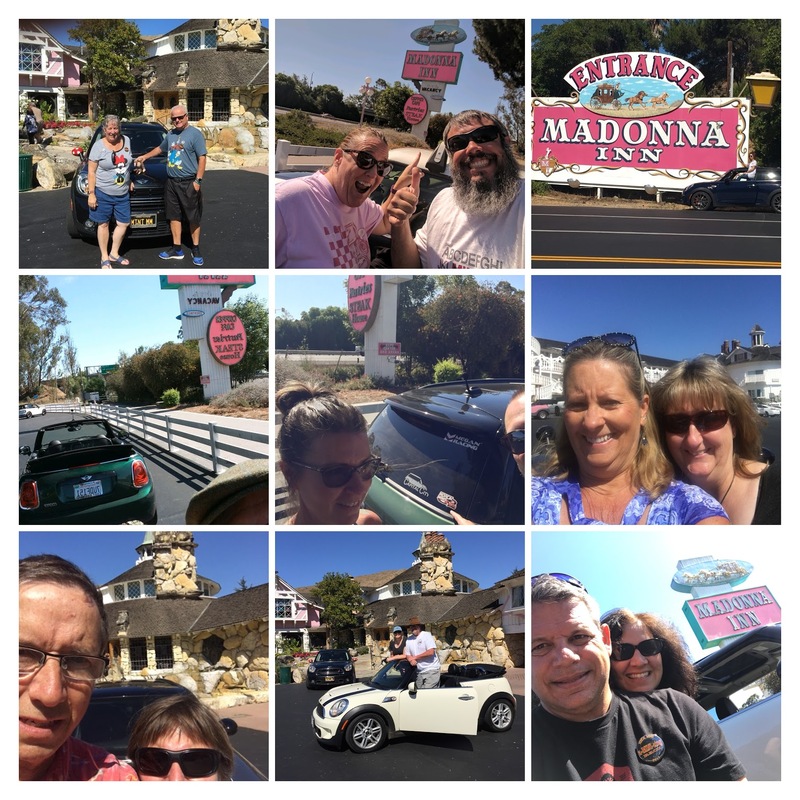 Before leaving, take your ‘postcard’ perfect photo of your team & MINI at the Madonna Inn. Your team will then be given all of the clues for the rest of the a-MINI-zing RACE. 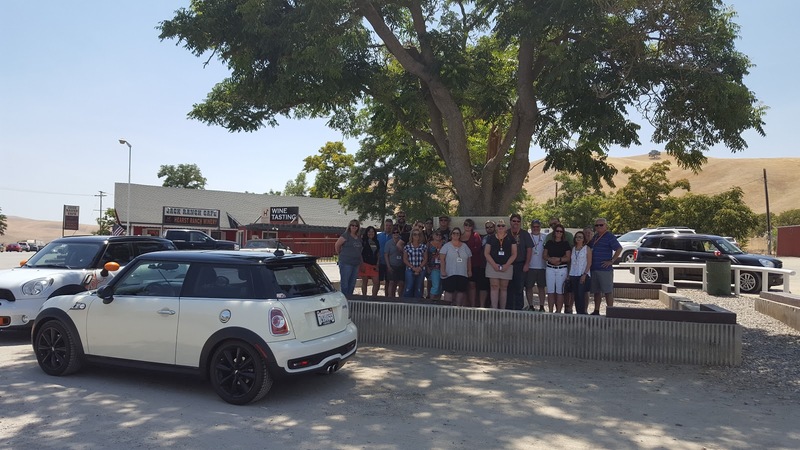 Proceed by MINI to: 2890 S. Higuera St. Standing for more than 100 years, find the 25 foot structure sheltering the mortal remains of a mother and child in San Luis Cemetery. It is estimated, at the time of its construction, to have cost between $75,000 and $100,000. Work as a team to complete the following task. ONE team member must be in the photo. 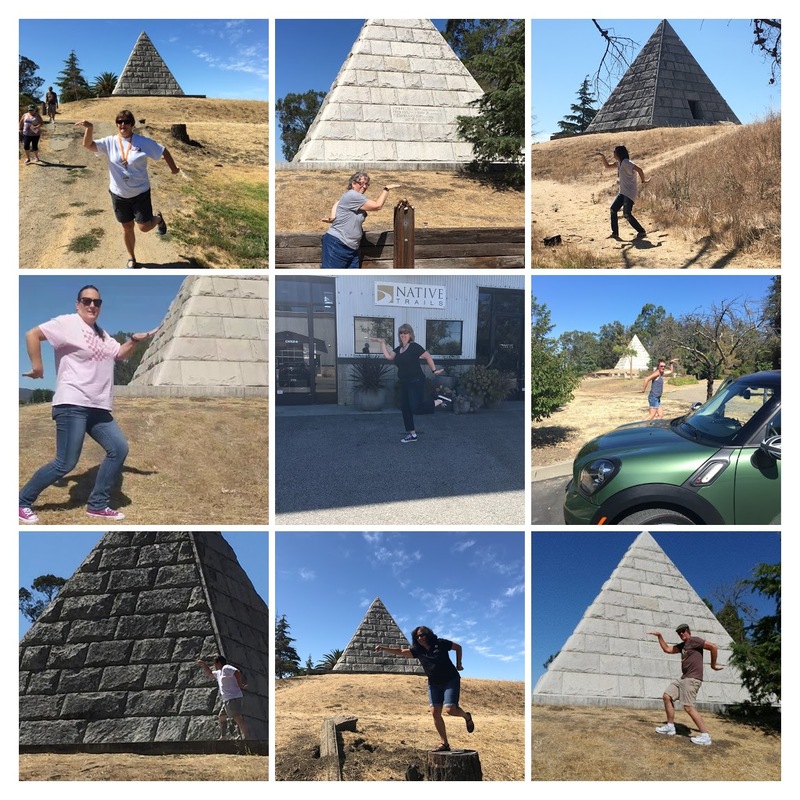 Capture your best “Walk like an Egyptian” with this structure. 700 block of Higuera Street, between Broad & Garden Streets. Did it start after WWII as a San Luis Obispo High School graduating class event? Or was it in the late 1950’s as a rivalry between San Luis Obispo High School and Cal Poly students? Who knows, but this landmark became well established by the early 1970s and the tradition continues today. Work as a team to complete the following task. Both team member must be in the photo. Leave the MINI parked & travel by foot to the next location. Named after Saint Louis, Bishop of Toulouse, founded in September 1st, 1772 by Father Junipero . It’s walls are 50-60 feet high according to Vatican law that states they must be as tall as the local tree – in this case, the pine. 3 Ring-a-Dings. ♰ marks the spot. Open 24-hours a day, this SLO DO CO place is a coffee-study-music mecca with the busiest time of the day between 8pm to 12am. Each team member must ask for their “MINI” treat. 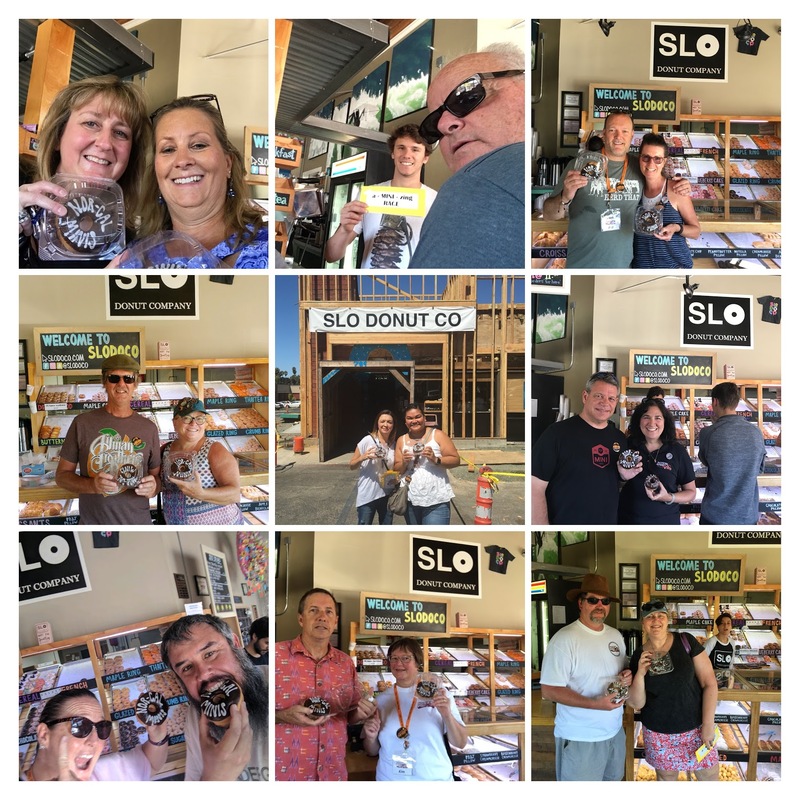 Be sure to capture SLO DO CO, your treats and both team members in photo. Find Phil (Christine & Michael) waiting for you at the first of its kind in the world. Located near the Apple Farm, this historic landmark was once a destination for movie stars on their way from LA to San Francisco by car. Featured as a hoteldom in bungalows with free garages, this location is only a shell of itself from its glory days and closed down in 1991. However, there are plans to return it to life in the form of a modern 55-room inn sometime later this year. Capture your team, MINI & the only sign left of this landmark. After a few minutes of deliberation, PHIL (Michael) and I decided Brian Dotterer & Crystal Tucker were the WINNER! 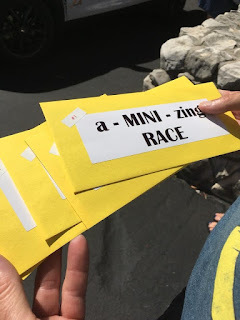 of The a-MINI-zing RACE - San Luis Obispo.